June 13, 2017 (LBO) – Sri Lanka obtained 1.3 billion US dollars worth loans as project loans from various bilateral and multilateral development partners last year. External Resources Department said in a report that 34 percent of loans have been received from China while 26 percent was obtained from the Asian Development Bank. 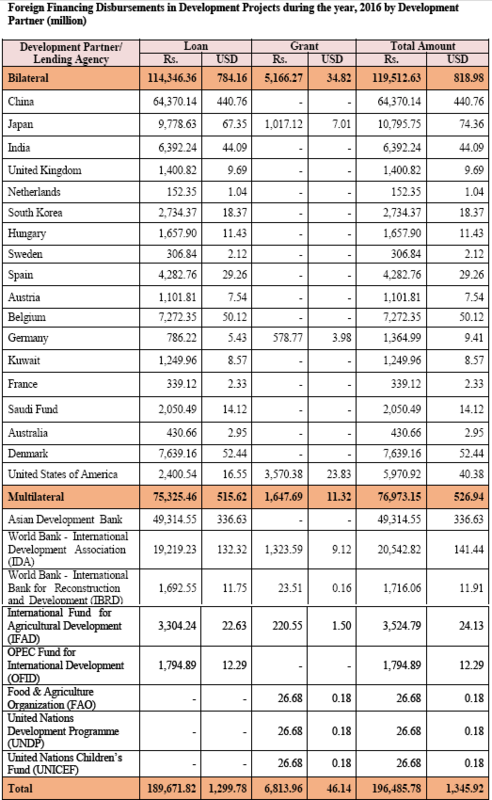 Out of the total loans, 10 percent has been provided by the World Bank’s International Development Association. According to the External Resources Department, Sri Lanka has received 46 million US dollars as grants last year. Aside from the project loans, three loans worth 287 million dollars have been received during the year. It included development policy loan obtained from Japan, disaster risk management loan from IBRD of the Word Bank and fiscal sustainability loan from IDA of the World Bank. In 2016, total commitments made to Sri Lanka were 2.3 billion dollars of which loans amounted to 2 billion dollars and grants 240 million dollars. Foreign financing commitments are agreements signed between Sri Lanka and the development partners and lending agencies during the year. The total committed undisbursed balance of foreign financing at the end of 2016 was 8.3 billion dollars. As per the department, more than 65 percent of foreign loans which were provided by China, Asian Development Bank and Japan were to be disbursed as at December 2016. Apart from these, Sri Lanka issued international sovereign bonds worth 1.5 billion dollars and a foreign currency term financing facility of 700 million dollars was signed last year. The department has also facilitated state-owned enterprises to obtain 1.3 billion dollars foreign financing under treasury guarantees to implement eight infrastructure projects. Total disbursements in terms of loans and grants received from foreign development partners and lending agencies through development projects and programmes in 2015 amounted to 1.5 billion dollars. Of which, loan disbursements were 1.4 billion and the balance was disbursed as outright grants.